Everyone looks forward to the big Ultrasound day, getting to see your baby for the first time is exciting, though if you know you are having twins, this probably isn't your first ultrasound, and won't be your last! This ultrasound is standard for all pregnancies (not just multiples). It is done when you are about 20 weeks along, but is usually repeated later in pregnancy if you are expecting multiples. My second level II ultrasounds were done around 30 weeks. This is done to assure that both babies are growing at a healthy rate and that intrauterine growth restriction, twin to twin transfusion syndrome (TTTS) or other complications are not affecting growth. 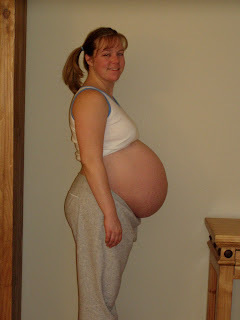 With a singleton pregnancy, if mom’s belly is getting bigger, you can be quite assured that the baby is too. But with two inside, it is good to have more assurance that both babies are growing well and at a similar rate. This ultrasound is essentially your babies’ first physical exam. The technician will take time to measure several different parts of baby’s body, including baby’s ‘crown to rump’ length (it’s hard to measure a baby’s total height when she’s all squished up in there! ), head circumference, length of arms and legs and even of her little foot (which is a great measurement to keep track of and note or draw if you keep a pregnancy journal!) I actually asked the technician to simply print the screen on which she tracked all of my babies' measurements. Of course, you can learn the gender of your babies if you want, but be sure to let the technician know if you want to be surprised. The technician (or sonographer) will also ‘examine’ some of babies’ major organs – kidneys, heart and brain. They do this to the extent that they examine each heart chamber, and identify the sections of her brain. They also view and measure the stomach. Suffice it to say that if they don’t find anything unusual, you probably have some very healthy babies in your big belly. If you see something you like, be sure to ask the technician to print a photo for you. Most technicians will give you a whole bunch of shots from the ultrasound, just be sure you check them before posting on your facebook profile as I found mine had my birth date, full name AND social security number embedded on them! So much for privacy…I wonder if they shred those when they are done? Before your ultrasound, you may want to consider the following so you can be prepared. First, it takes about 45 minutes to do this detailed examination on just ONE baby. Add a second baby in there, and you could be in the ultrasound room for an hour and a half. Now consider that baby B will sometimes get in the way of a measurement they are trying to get on Baby A and now you could be in there for up to 2 hours! I recommend taking a potty break right before the exam (presuming you don’t need a full bladder as you do with earlier ultrasound exams). Also, you might bring a snack if it will be getting close to meal time. This site "What to Expect", has some great info on ultrasounds and all pregnancy testing. Your physician should recommend that you begin kick counts some later point in your pregnancy. If your physician does not tell you when to start, you may do it on your own anyway, there are no risks...other than that you might freak yourself out and have trouble sleeping if you tend to worry alot! I started kick counts around 30 weeks, but you can start as soon as you can reliably and daily feel your babies move, perhaps around 25 weeks. It is a very simple way to give you peace of mind that your babies are doing well! Here’s how to do it. The guideline I was given was that I should feel 10 movements from each baby, within two hours. It is easiest to do this during your babies’ most active time of day. The ACOG recommends simply keeping track of each and every baby movement you feel from each baby, and when you get to 10, note how long it has been since you began for that baby. If it takes longer than 2 hours, try again later in the day. If you still cannot detect 10 movements in a 2 hour window all day, you should let your physician know because it may be a sign that one of your babies is in distress. This is a great article about how to do kick counting. Reduced fetal activity is an indication that baby might be in distress and potentially not getting enough nutrients or oxygen. So if you notice one of your baby’s activity dropped suddenly one day such that you cannot detect the 10 movements in 2 hours, try again later in the day and contact your physician if you still cannot detect 10 movements in a 2 hour window. Some women will say that they feel their babies move less as they get bigger. I agree that I felt less overall movement as the babies got bigger because there was probably less room to move in! But I personally think this is because the movements are just not as strong and pronounced and I just didn't notice them, even though they still happened about as often. I would say that you should pay really close attention to make sure you catch all the little flutters. But if you do notice a sudden change over a day or even a few days, you should probably call your physician - at least that is what I would have done. Bottom line is: if you don't count enough kicks in 2 hours, call your physician. She will be glad to put your mind at ease and you will feel better too.